As the photograph suggests, every issue of a magazine is a compilation of stories. And all of it unfolding under what should be the eagle eyes of editors who merely wish to make those stories as successful as they can possibly be in terms of theme and expression. Then come the loving hands of designers, and the fine back-and-forth that at its best yields story presentation that readers don’t want to put down. May I advance this formula: Sharp ideas + sharp writing + sharp design = sharp magazine. 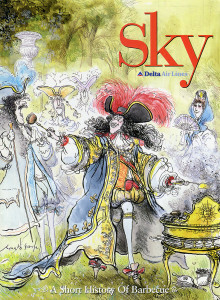 It appealed to me greatly to lead a magazine called Sky for Delta Air Lines. No audience was more diverse: younger, older, richer, poorer, more educated, less educated, domestic, foreign, an audience we would eventually double to more than 4 million readers per month. 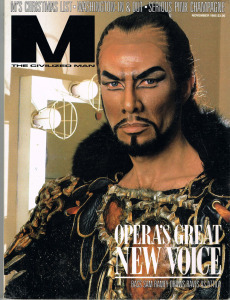 M: I learned the ropes of feature writing at this very good men’s magazine in the later 1980s. 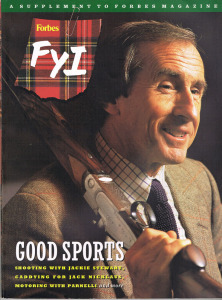 It was published by Fairchild Publications, and we called it a “fashion-able” magazine, as it blended a large corps of fashion coverage, the stock in trade of this publisher, with witty, timely, cheeky copy. You didn’t succeed at Fairchild unless you were “quick, cheap and good,” and I left as a Senior Editor. Forbes FYI: I had the wonderful opportunity to participate in this start-up, which was correctly regarded as “one of the most successful of the 1990s,” along with Editor Christopher Buckley, Publisher Bob Forbes and Art Director Alexander Isley. As Managing Editor of the quarterly lifestyle magazine, did I learn! And did we have fun, which is utterly critical to the success of any feature magazine. 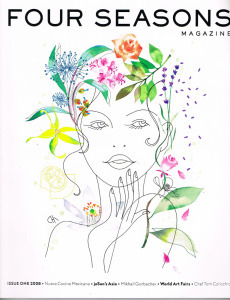 If your magazine doesn’t radiate joie de vivre, then there is something wrong with it – and with you. Sky: I will always be grateful to Pace Communications and its CEO Bonnie McElveen-Hunter for selecting me to lead the recreation of Sky in 1995. At that time American inflight magazines were, put simply, dogs. (An exception was another Pace title, Hemispheres.) But there was no reason why they had to be. Delta approved a bold new vision, and we were off. What was the ultimate compliment? Readers who said they were flying the airline to read the magazine, who said they were deliberately traveling at the end and beginning of months so that they could see 2 different issues. Yes, it happened! 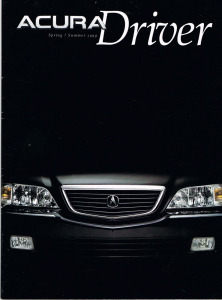 AcuraDriver: Pace excelled at custom publishing, a niche insulated from the worst of newsstand faddishness. We were selected by the luxury automobile manufacturer to recreate their semi-annual magazine, and we built it so that every aspect of its editorial featured the driving experience, whether directly or indirectly. It worked: Reader response to the initial issue was six times as great as to any issue of the previous publishers. 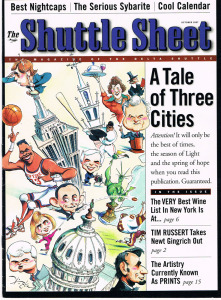 The Shuttle Street: This monthly “tale of three cities” served the elite Eastern audience traveling between Washington, New York and Boston. Everyone talked to us, from PR guru Howard Rubinstein nakedly revealing the tricks of his trade to Jean-Georges Vongerichten sharing his recipe for Thanksgiving stuffing. It was the quickest of reads but teemed with suggestions for any and every hour of the day. 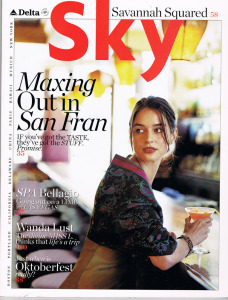 Sky (2): Magazines need refreshing, and this was the first from our original. The Meatpacking District in Manhattan is now well-established as a boutique-driven tourist zone. In 2000, though, you still thought twice about walking some of its side streets. Meanwhile it was attaining white-hot status, and that’s why the new Sky was there, just as our excellent corps of contributors kept us everywhere that real travelers wanted to be. Renaissance: The Wealth Management division of what was then the Wachovia Bank wanted an elegant magazine for its very affluent clientele. This magazine skillfully blended beautifully illustrated lifestyle editorial with longer-term investment planning advice. Why not take the luxury bicycling trip, it asked, when such a trip would give you the kind of quality time with your family – some of them your heirs – that you rarely got in daily life? Or, “So You Want to Own a Winery?,” detailing the real costs and hard work of what might be a compelling whim. 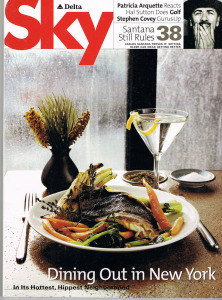 Sky (3): In 2005 we were ready again for a redesign. 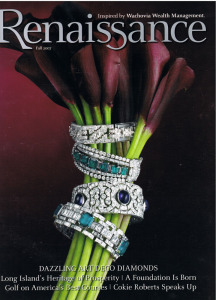 Working with world-famous designer Robert Priest, we created a magazine that faithfully reflected its moment. Men were more fashion-minded than ever – and weren’t afraid to admit it. Women were more sports-minded than ever – and weren’t afraid to admit it. Columnist Wanda Lust punned her way to travel glory, and “Thought Leaders” followed. Four Seasons: The hotels and resorts were and are the gold standard of the trade. What they wanted was a magazine that ranged as widely as their orbit of properties, and was as intelligent and erudite as their typical guests. They got it, and when a website was added with the same values, Four Seasons was recognized as Best in Custom by the Custom Content Council, its highest award, in 2010.